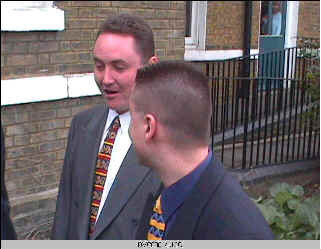 Graham in a suit... must have been the court case then!!! Vice-chairman and solitary long-suffering Spurs fan, brunt of many anti-semitic jokes. Another original member of the clan, finally hit the heights of League Champion in Serie G (following some dodgy dealings, a team that was half-picked for him, and free reign at the best that Spurs have to offer (not much then!!!) – if you believe the scurrilous rumour mill that is!!!!). Performances in the league have varied over the years, and there was a time that like his beloved Spurs it was thought that he could only win cups, and not too many of those either. Drinks with the big boys, possesses the bladder of a hamster, and has been known to have the odd tactical spew in times of need. Famed for his ability to sleep any where at any time, even on one notorious occasion half way through an Auction!! !